Heat 1 Tbsp of olive oil over medium-high heat. Once hot, add the onion and okra to the pan. Place the okra seed side down and then sprinkle with the diced onion. Do not stir the okra for 3 minutes so that it can brown. If you don't brown your okra it will likely be slimy. After 3 minutes give the vegetables a stir and cook for 1 more minute. Transfer the okra to a bowl and set aside (do not cover). 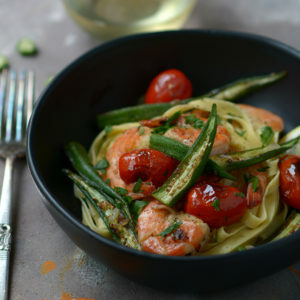 Add another ½ Tbsp of olive oil to the skillet and add the cherry tomatoes to pan. Cook them for about 3-4 minutes, stirring every minute or so until they begin to soften and blister. Transfer the cooked tomatoes to the bowl of okra and set aside. Reduce the heat to medium. Melt 1 Tbsp of butter in the skillet and then add the shrimp, minced garlic, and crushed red pepper. Cook for 2-3 minutes or until the shrimp is pink and cooked through. Add the tomatoes and okra back into the skillet and season with salt and pepper. Cooking for 1 more minutes. *Feel free to use tail on or tail off shrimp. **Serve this recipe atop pasta, couscous or rice for a complete meal.